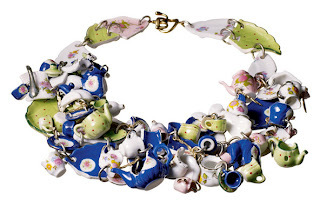 Just yesterday I published a preview of some interesting jewelry that is Alice in Wonderland inspired and to go with Tim Burton's movie in 2010. Here is more. This item is from Tom Binns. Of course, something like this is going to be ridiculously expensive. On the plus side, there will be more reasonably priced items available. If I don't talk to you before then, have a Happy Holiday!